Having had a short chat with the newly arrived local ecotourists from Jakarta, I continued walking to my room. Passing one cottage, I returned to them. “Please don’t buy the crab,” I said. “Please, please, let it live. It is rare, an endangered species.” They look at me with surprise, but said nothing. The tourist group (8 persons) arrived at Lestari Cottage, Malenge Island, Togean, Sulawesi, by a small boat late in afternoon. A moment later, Rudi, the owner of the cottage, showed them the coconut crab (wikipedia.com/Coconut_crab : “the largest land-living arthropod in the world”) he had kept under a bucket on the floor of the kitchen. Then, I heard the talk about buying and eating it. “I bought it for 90 thousands ($8.5),” Rudi said. He had told me before “50 thousands” from a local who had caught it in the forest. Overhearing this business talk made me sick. 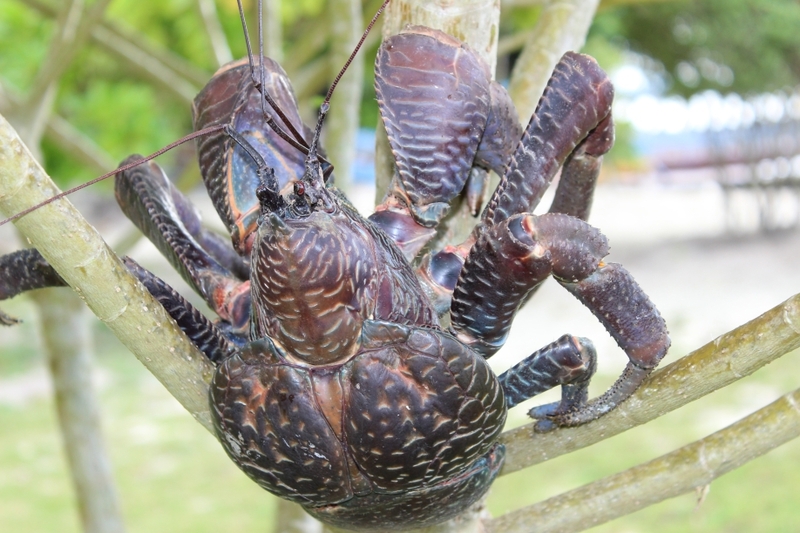 Rudi knows well about the endangered status of the crabs and about the tourists who stay in his cottages loving to see them free in the nature, but, sadly, he is tempted to sell it to the local tourists to eat. I believe the local tourists might also have known about the crab’s status but, somehow, they could not control their culinary adventure. They had bought two lobsters and asked the cook to fry them for dinner. To them, 150 thousands ($13) per kilogram of lobster is very cheap—to me too, but having seen them alive in the ocean, I lost my appetite to eat those beautiful creatures. The group left early next morning for another cottage in a different island. They did not bother to enjoy the beautiful nature around the cottage and admire the peculiar culture and life of the sea nomad group across. However, they took a lot of photos when they visited the Plank Island of the Bajo tribe for about 30 minutes. As soon as they left, I asked Rudi to see the crab–pretending unaware about his business talk with the tourists on the crab—and felt relieved to see it still alive. My “sabotage” succeeded. However, I had not had any courage yet to ask him to release the crab. Next time. I met the group again on the ferry boat taking us to Gorontalo, Sulawesi mainland. They only stayed two nights in Togean Islands on two different islands. In contrast, a German couple spent 10 days in one cottage just for swimming, snorkeling, sunbathing, reading, or even only staring at the blue sky and crystal-water ocean for hours. No plan, no rush. The attitude and behavior of local and international tourists in the exotic destinations are very different. The main goal of the visit of local tourists is to take photos as many as possible for uploading onto their Facebook timeline! This behavior is fine too me, but their destructive behavior and act—buying and killing endangered species and thrashing the ocean with plastic bags and tin cans—are not acceptable.